My apologies for the quality of this photo taken in the 1950s. The only reason I submit it for inclusion in the archive, is that it shows the entrance to the underground air raid shelter in the Lady Neville Recreation ground. It is the triangular white shape on right. I am hoping that this may prompt someone else to bring out their better picture of the scene. The smooth face of the slabs covering the entrance, which is on the left hand side, made a good slide! Happy days! I think this photo may have been taken in the very late 1950's or even 1960's. I cannot recall all those small trees being there when I left the school in 1954. If they had been there, they would surely have shown in the school photos up to 1955 which were taken with the hedge and road as a background? Please answer a question for me. Was there an underground air raid shelter in the park? If so, was it round (Doughnut in shape) and lined with metal bunk beds? I have this memory of sleeping there. Maybe after the bomb struck, seeing as our house was in a bit of state. My mother, three aunts and I were in the Morrison shelter when it exploded. My granddad was in the garden watching it. He was hit on the head by the leaded toilet window. Note from LNW - This question was received via the BHRG website and comes from William (Bill) S. McBean formerly of Harbourfied Road. The photo above clearly answers the first part of the question but can anyone help with the second? My recollections of the air raid shelter in Lady Neville Recreation Ground may well be faulty as I only spent very short periods in there, having been 'shooed' in by a warden. Discovering the emergency exit between a beech hedge and the tennis court's wire-link fence, I was pretty soon out of there – probably before the siren had finished! My impression of the shelter was that it was rectangular – no bunks but benches each side – cinders underfoot and not very deep. It was originally dug trench-like but later covered over. The angled entrance, with a pair of wooden doors, was facing the (bowls) pavilion. The reverse slope was concreted at a later date. There was a wardens' post immediately you entered the Ground by the gate in Avenue Road, opposite the school. I would like to express my gratitude to Mr Shackel for the response to my air raid shelter question. It's clearly nothing like my foggy memory. I do recognise the concreted over entrance. A gang of us used to play football in the space between this and the cricket green, much to the annoyance of the park keeper. When we had enough of football or it got too dark, we used to chase the girls who came to watch and pass comments about us. Those were the days. I will just stick with the memories of the place and people even if they are a bit fuzzy. Like getting six of the best for walking out of the junior school one day and trying to join the travelling circus sited up Park Road. I delivered papers up that road as well, and it was the road to the sledging hill. Oh! It’s all coming back. If I recall correctly - it's a long time ago! - there was a similar concrete structured shelter entrance at the junction of Great Tattenhams and east side of Tattenham Crescent. I don't know if these type of shelters were of similar design or all different. I am too young to remember if I was ever in one! Back in the 80s the concrete pyramid collapsed and opened up the shelter. I went down there and from what i remember it was quite narrow and square in shape. My dad told me there was also a shelter to the left hand side of the main entrance to the park which was evident back in the 80s 90s by a long rectangular mound. I can confirm to Colin that there was a shelter to the left of the park entrance, behind the bowls pavilian. Two friends hid there after inadvisably upsetting a group of violent looking visitors from Sutton. The leader of the gang didn't want to look silly by going into the shelter so he threw a dustbin down through the entrance and was satisfied nobody was there when no sound came back. The white triangular object I only knew as a (useless) slide, which it was definately designed as but I never knew it covered a shelter. I was in the Infants & Junior school during The War. We were often marched across Avenue Road into this shelter which was not very deep, was square and had bench seats on sides. It extended up to the South side of the tennis courts where ventilation brick shafts were built. The Junior School had a brick & concrete shelter built in the `cycle shed`and when reinforced area made in the cloak lobby, we used this instead. The teachers were Mr.Paul headmaster, Miss Day head female teacher, Mrs Wood, Staddon and the best teacher was Mrs Ward. Mrs King was in charge of the Infants School. Three brothers from Belgium arrived about 1943 and two French brothers., none could speak a word of English!! I too recall the brick and concrete shelter in the school yard. When lessons ended we had to wait for a parent or adult to collect us. While waiting we had old jigsaw puzzles to do and redo..... My favourite was the Bisto kids - everytime I see their advert it takes me back to the shelter..... lovely memories. The Mrs. Ward referred to was in fact "Miss Ward" the sister of Bob Ward a very good player who played cricket for Banstead. He and Miss Ward lived in Warren Road. I also remember a Spruce tree surrounded by a metal railing which was planted in memory of King George V.
Bill McBean refers to someone call "Ryle". This was probably Peter Ryle who had flaming red hair - hence his nickname of "Ginger". He grew up to be a good fast bowler for Banstead CC. He later left Banstead and went to play for Mitcham. He lived in Harbourfield Road, his sister was Joyce. He has sadly passed away! 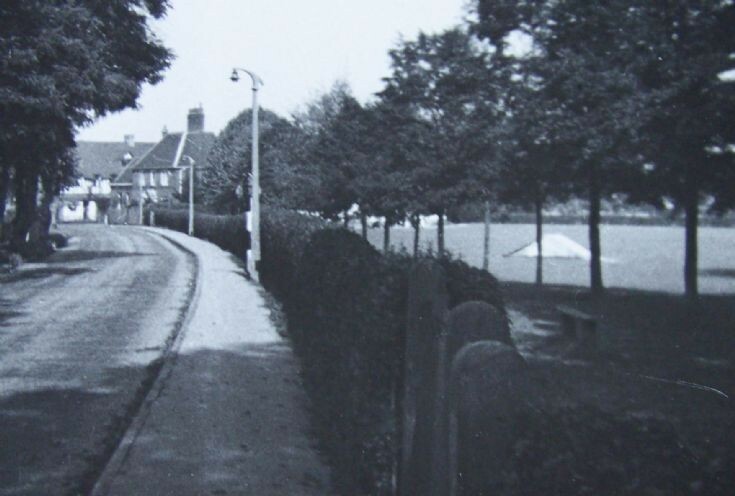 Hi, I lived in Laurel Cottage, opposite the park and the 'concrete triangle' from 1963 until 1984 when I got married. I agree with Jon Riche - the pebbly-concrete made a poor (and painful!) slide. I never knew it concealed the entrance to an air raid shelter until recently. It would appear there were therefore two air raid shelters - this concrete-covered one, and the one just behind the bowling pavilion, to the left of the main park entrance. The latter formed a raised 'hump' (good to climb on) and used to have steps down to a padlocked door - I think it is all now filled-in. It would appear to have been purpose-built for its use, and close to the park entrance. I have an interest in the site of the medieval manor of Banstead, and there have been some finds and wall lines discovered or visible as parch marks in the gardens to the west of Avenue Road and to the north of Court Road. There is also a rumoured void beneath the rear of Cheviot Close, said to be the cellars to the manor. I am therefore quite interested in 'voids in the ground' in the vicinity. The concrete triangle site strikes me as a rather 'random' place to construct an underground shelter - a slight distance into the recreation ground and not adjacent to any entrance - hardly the quickest place for residents to access. If anyone (especially those who have commented above) has clear memories of the space, I would be interested to know to what extent it appeared purpose-built as a shelter, or whether it is possible the shelter may have exploited a pre-existing void? If it spread to the south side of the tennis courts it must have been quite large. I appreciate I am asking 'mature' minds to recall 'infant' memories!